I’m ready to become a locavore — at least when it comes to gin. That’s because I am lucky enough to live less than a 10 mile drive from Pacific Distillery, producers of the delightful Voyager Gin. Voyager is a single-batch gin that is distilled from 100% neutral grain spirits using a 500 liter copper alembic still. In addition to juniper, Voyager’s botanicals are coriander, licorice root, cardamom, aniseed, lemon, orange, orris, angelica, and cassia. After the botanicals are added to the spirits and distilled, the gin is brought to 84 proof (42% ABV) and bottled. Pacific is a small, new distillery, and everybody pitches in on bottling day. Marc Bernhard has put a lot of love into this product, and it shows. On the nose, the citrus and juniper dominates. Straight, there is some hotness from the slightly higher proof, but also a luxurious richness from the base spirits. This is a fairly citrus forward gin, perhaps most similar to Beefeater 24, but I find Voyager more balanced between the citrus and the juniper. I’ve yet to find a gin drink I don’t like using Voyager. It makes a delightful gin and tonic. It’s great in a martini and even better in a martinez. Several great Seattle Metro bars are also using Voyager frequently, including Zig Zag. Last time I asked Murray for bartender’s choice, something with gin, he made me an Alaska Cocktail using Voyager, and it was fantastic. But we’ve been having something of a heatwave here in Redmond, and a friend gave me a new bunch of mint from his garden, so I thought I’d go with something refreshing. The gin-gin mule, created by Audrey Saunders, is a great drink. 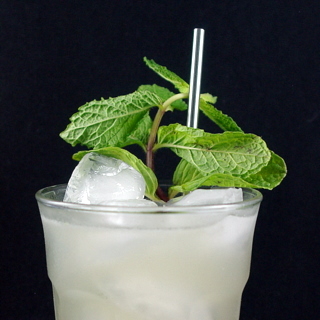 Shake gin, lime juice, simple syrup and mint leaves. Strain into ice-filled collins glass and top with ginger beer. Garnish with slapped mint. Sip on a sultry evening. Voyager Gin is available in many Washington State Liquor Control Board stores. If yours does not have any, be sure to ask them to stock it. Voyager is also being carried by DrinkUpNY, which may be able to ship to your state. He had already created a cocktail called the Voyager, so he named this one after the ship on the gin’s label. something i love to drink that’s similar is 2 parts gin, 1 part fresh lime juice. 0.75 parts simple syrup and a few dashes bitters. shake and serve up in a martini glass. Let me know how you like it. And yes, definitely will see you at Tales! I couldn’t find Voyager gin so I tried this with Bombay and it was delicious! I think I’ve found my 2009 Summer drink! Damn you, you made me just want my Voyager bottle. It’s at home, though. I’m so glad that someone else is blogging about Voyager gin. It’s DELICIOUS.